The 2020 pension reform was rejected by the people in September 2017, what happens next? It will certainly be harder for employers and employees, because the current situation is not likely to evolve. Indeed, due to the increase in life expectancy, demographic ageing and the persistently low interest rates, the Swiss pension system is facing some serious challenges. Therefore, personal pension plans are becoming an essential complement. Each situation and life path comes with its different needs and motivations. Firstly, entry into the world of employment, the first work contract and the first pay. Afterwards, maybe a desire to create a family, thinking about getting married, dreaming of one’s own house… During this time, concerns are often more focused on the education of children, their schooling and the protection of the family. Then children grow and prepare to enter the “real world”, they will become independent, perhaps leaving the family: it is time to think about yourself, the couple, the future. We believe that at any important moment of life, and with every major change, it is vital to assess the situation as regards one’s own pension plan. The best way is to ask for a “risk and pension analysis” in order to set your goals. Individual pension plans offer saving solutions, death and disability cover in the form of 3A and/or 3B contract. Please have a look at the table at the end of the article showing the processing and the benefits of each one. As you can see, there are enough opportunities to choose at best how to build up a capital for retirement or for other reasons; you can always find the one which is most suitable to your character. Indeed, we are all different as regards the perception of risk. For the constitution of 3A savings, it is recommended to create at least two accounts or policies, or even more, with different contract expiry dates in order to have a lighter exit tax; in addition, this allows for a certain diversification. Death and disability risk covers can also be entered into in the form of a 3A and/or 3B contract; however, only insurance companies may propose solutions. It is important that the proposed solution is well explained, because once more, the tax treatment of benefits is not the same. The beneficiary clauses must be well detailed. From the analysis of your pension and your objectives, results your potential need for coverage in case of death and invalidity. It is important to note that the regulatory framework is identical for both banks and insurance companies. It is governed by the Ordinance on Tax Deductibility of Contributions to Recognised Forms of Benefits Schemes (OPP3). Banks offer accounts with a profitable rate (interest rate). Your assets may also be invested in investment funds with strategies offering a variety of risk exposure in shares, but not going beyond 50% of what is limited by OPP3. With banks, it is possible to pay into your account at all times, depending on availability. They offer solutions with guaranteed capital, i.e. with a technical rate which today ranges from 0% to 0.5%. Such a technical rate is not imposed by the companies, but by FINMA, which is the supervising and regulating body. There are surpluses which, according to the package chosen, are paid and guaranteed. Since the arrival of negative rates, the technical rate is certainly at its lowest, which is why insurance companies, amongst others, have become more creative in their offer. 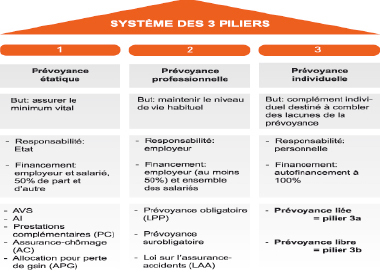 Insurance companies also offer solutions without guarantee related to investment funds, in the same regulatory framework as those offered by banks (OPP3). Insurers are often blamed for being less flexible than the banks; however, in recent years, they have striven to make their products more “adaptable”. In addition, there are some guarantees given by one and not the other (VVG, Swiss law on insurance contracts) especially in the event of succession, protection in the event of bankruptcy and tied assets (see table at the end of the article). This is why it can be also a good idea to subscribe to a 3B pension policy, because all the above guarantees are given, in addition to the tax aspect for some cantons. For death and disability coverage, rates may be cheaper depending on the insurance company, as several factors are taken into account, such as height/weight, level of education, occupation, smoker or not, physical activity, etc. This depends on statistics specific to each company. In most cases, it is advisable to separate savings and risk. We strongly recommend that you refer to a pension specialist to discuss your expectations. When they have determined your needs, they will proceed to determine the best offer able to provide you with the best solution on the market, (bank and/or insurance). While comparing products, the advisor will have to talk about costs, guarantees, allocations of assets, regulations, terms and conditions, evolution of the cash surrender values, beneficiaries, etc. This list is not exhaustive! It is important to know that there is no big or small budget in terms of pension planning. The earlier your planning begins, the more your account will earn through compound interest. Optional subscription to a private customised pension plan according to analysis of needs and regular adjustments. Regular premiums, option to make additional flexible payments (depending on the product) and interruption of the payment of premiums for 4 years max. Flexible payments of the amount of your choice. Self-employed 20% of taxable Income CHF 33,840 max. Savings and interest become part of the estate. The insurance solution guarantees a 100% coverage of funds and savings goals. Do you need expertise for your individual pension plan?